Hello there Quilt-Alongers! I have a tutorial for you, whew! Because I will confess I'm only days ahead of myself when I push that publish button! :) But that's okay because this quilt top is coming right along. 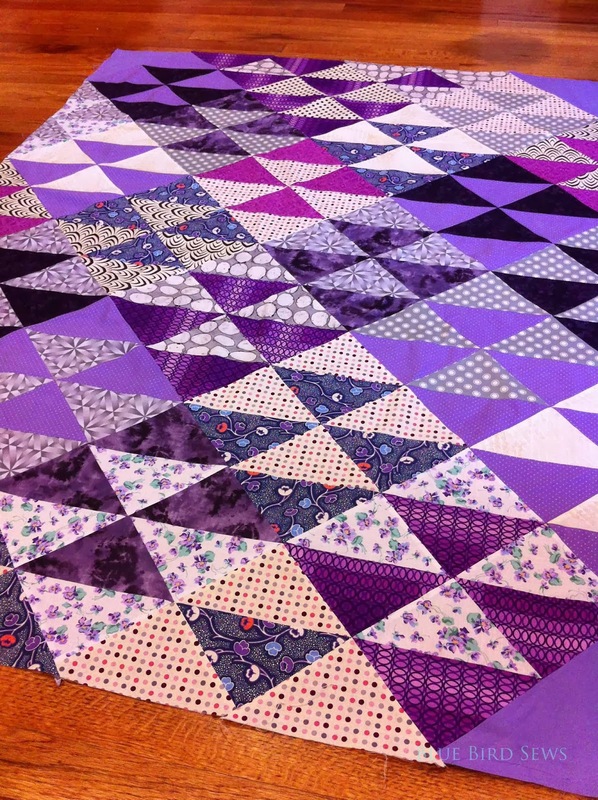 I do love to see a quilt come together! Oh and since I last shared with you I was told about the Pantone Challenge hosted by Adrianne from On the Windy Side and Anne from the Play-Crafts blog. The colors I am using are perfect, are you doing purple too? Well then let's join in! All right so now let's get back to the quilt along! By now the blocks, side units and top and bottom units are sewn together and you've been playing around with the layout on your design wall, dinning room table, open floor space. Great! 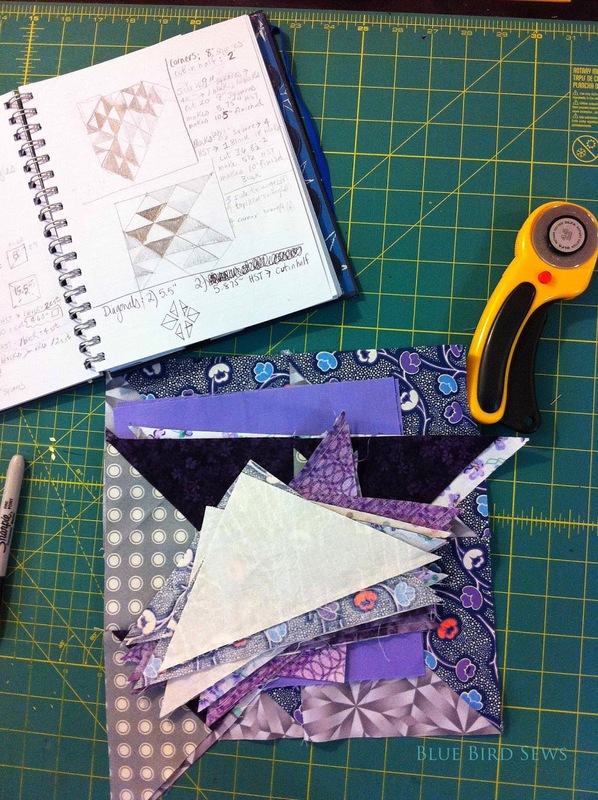 Let me show you how to sew up a diagonal set quilt because it really couldn't be easier! First step is to get that layout just how you want it. Start with the main center blocks. 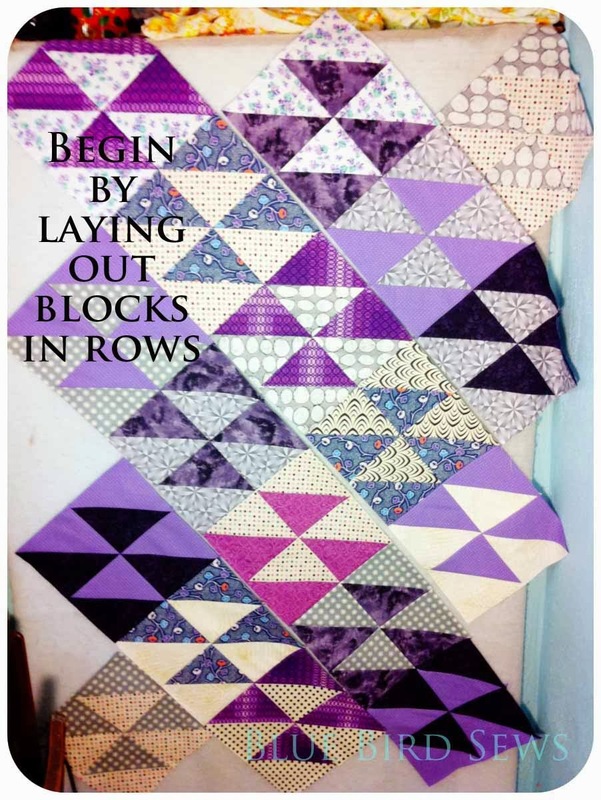 The quilt goes three blocks across, then two blocks, then three, then two, then three, then two, then three. On point there are 4 blocks down. Once those are laid out start adding in the side/top/btm units to get a nice variety of patterns and colors. 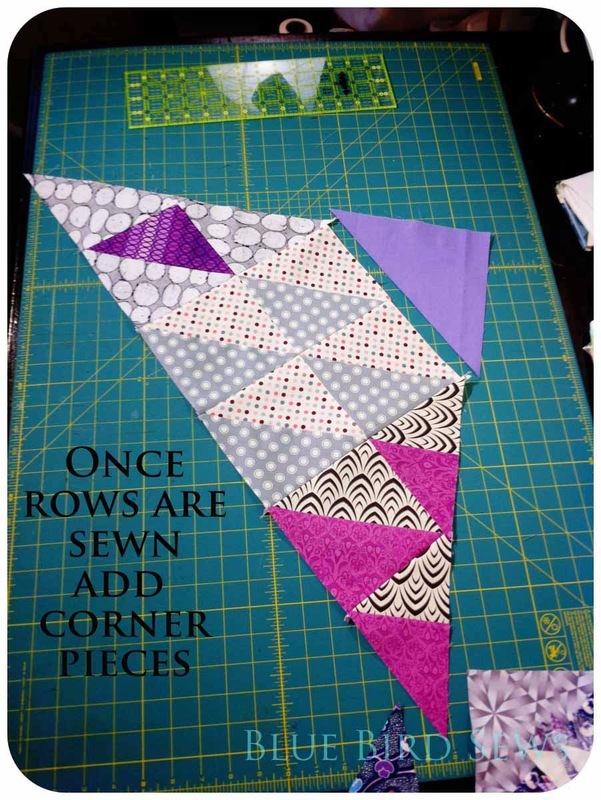 Next you'll add the solid corner triangles that are cut from 2-8" squares. Add those only to the ends of the top/btm rows. 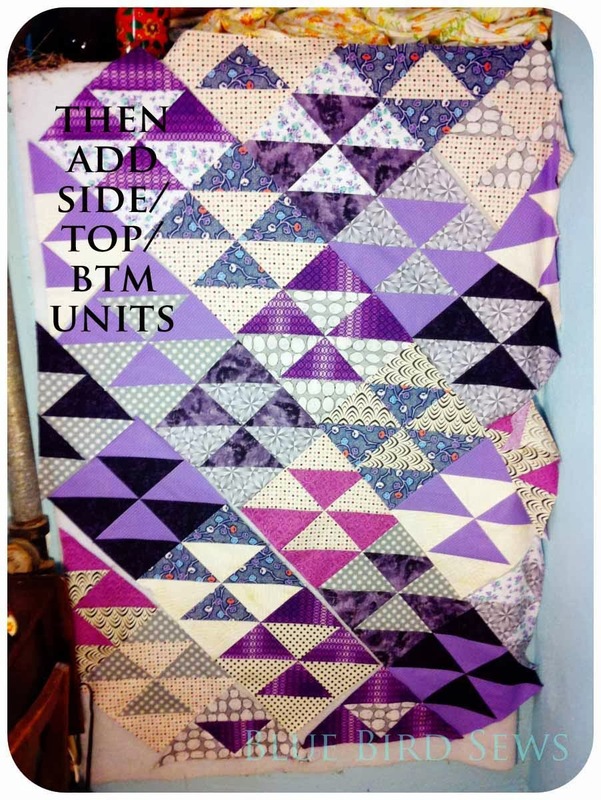 You will add them to the top/btm side units once the rows are sewn together (see photo below). With all the blocks laid out how you want them it's time to sew the blocks and units together into rows. 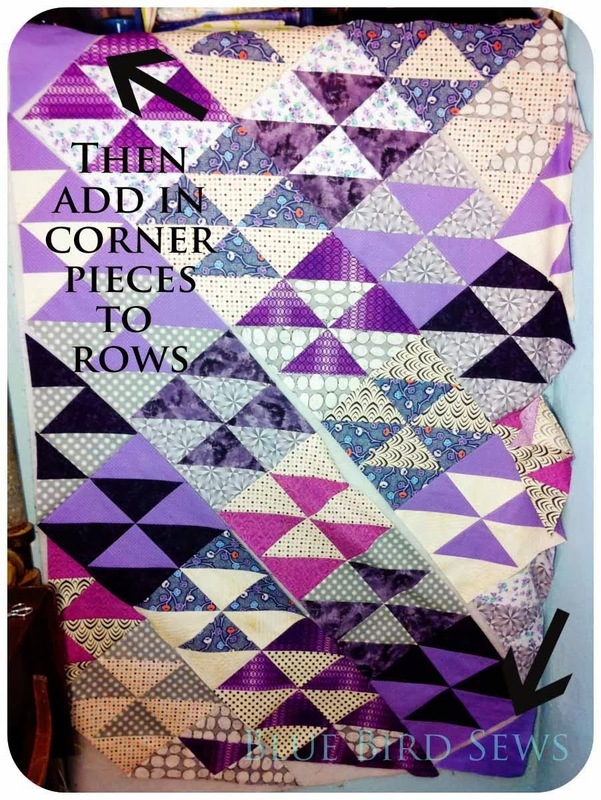 Begin by matching up the seams in the middle and pin out from there to the edges on each block. There will be six rows all together. Once the six rows are sewn then sew the rows to each other. 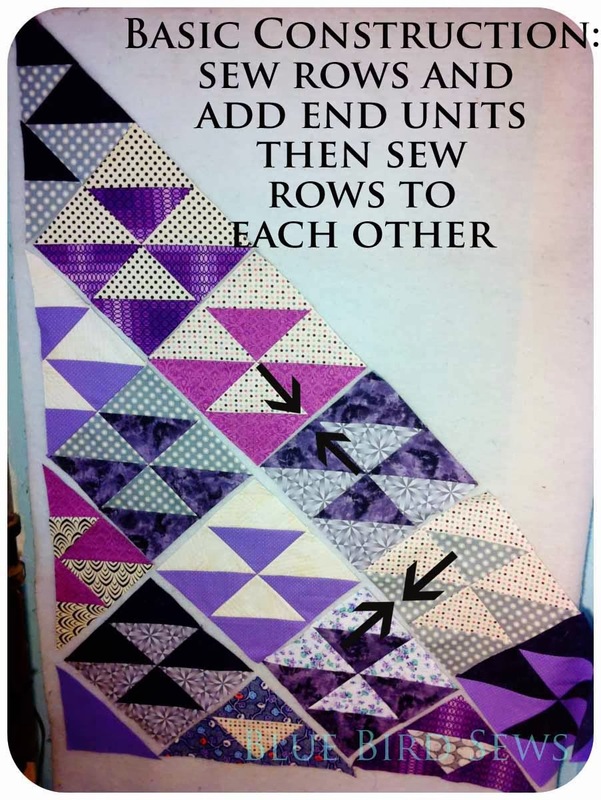 Join rows to each other by again matching up seams first and then pinning to the edges. On the blocks and the rows the edges of the side and top/btm units will be a little overhang from the triangle (like a dog ear) and this is good, you'll want that to create a seam allowance. That is why you pin from the seam and work out to the edges so that bit will hang off. Here is the first row all sewn up and read to attach the corner triangle to finish off the edge. Work slowly and carefully matching up all the seams and pinning a whole lot especially when sewing all the rows together. The bias edges are very forgiving when stretching seams to match them up but they are also be very fidgety so pin well! A tip for working with the bias is to starch the heck outta them to make them stiff and flat! Waaa-laaa! A quilt top all sewn up! Hooray! Hooray! So if you've got a question or need clarification on any step of sewing the blocks and row or corners let me know! I'll be back next week to talk quilting, but first I have to stare at this little gal and see what way she wants to be quilted! OK, I finally figured out that I need to come up with a color plan. 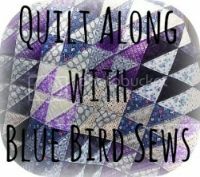 ... in the next few days and then join your quilt along.